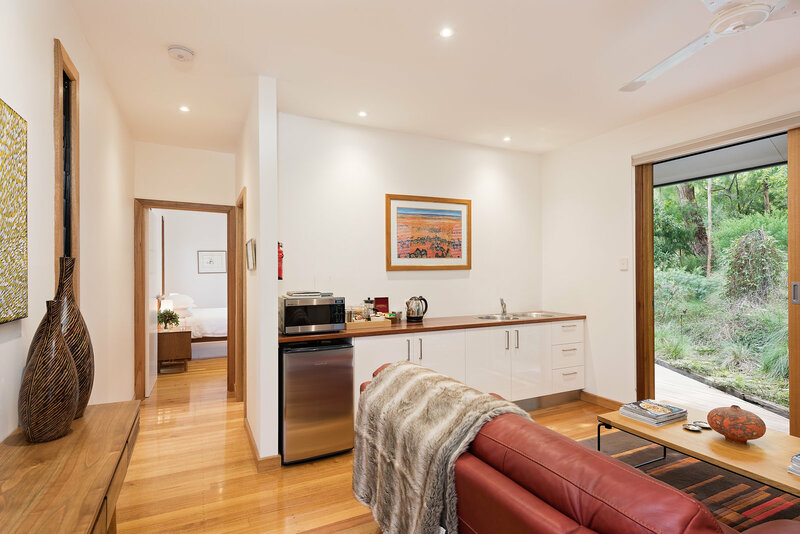 Nestled amongst towering stringybark eucalypts in the beautiful Adelaide Hills, just 30 minutes from the city centre, a haven of luxury and tranquillity awaits....Cladich Pavilions. Cladich Pavilions is the perfect place to relax and unwind and get away from it all. Enjoy a lazy afternoon on the deck, or get out and explore the many wonders of the Adelaide Hills regions. Experience outstanding wines to delicious local artisian produce or perhaps take a walk along one of our many local bush walking trails. 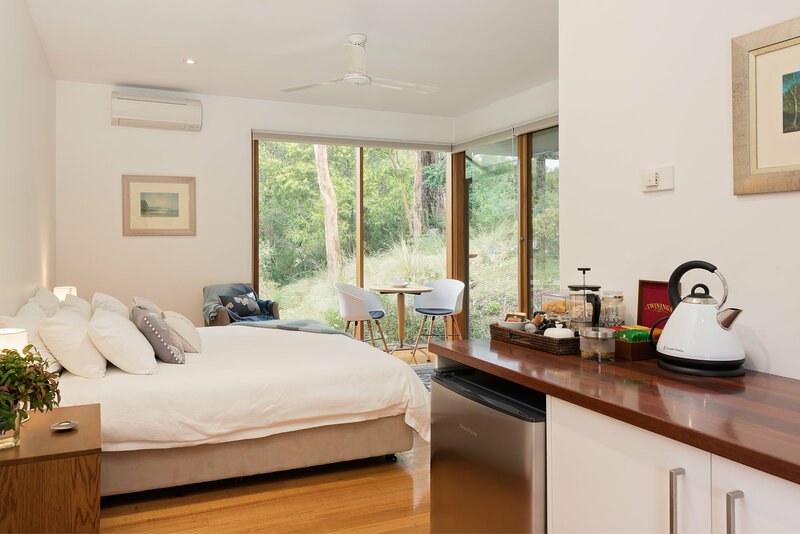 The Billabong This charming room is enhanced by its large windows overlooking the native vegetation with its abundant birdlife. With a restful blue color theme, large king bed and two person bath it is the perfect retreat for honeymooners or those just wanting to relax. The Dunes This pavilion is a similar style but smaller than the Gums. It has limited cooking facilities which include a microwave. You may also wish to cook on the balcony and use the barbeque. The warm outback colours make this a welcoming haven. The Gums Perfect for dining-in, the Gums has all the comforts you'll need for a relaxing stay. 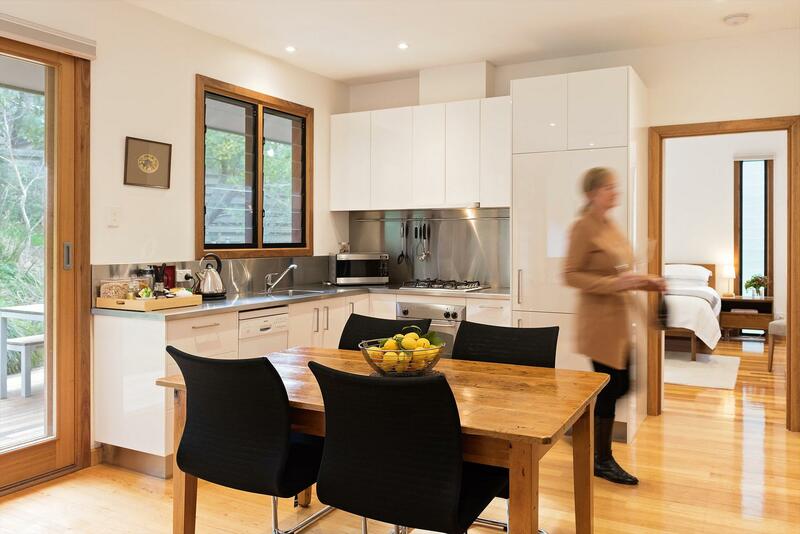 The Gums features a complete and modern kitchen having everything you need for a dinner party. Why not book all the pavilions and entertain here. Your breakfast supplies showcase what gourmet delights the Adelaide Hills have to offer. The Billabong offers a king bed studio room which can be split to create two single beds if requested at time of request. The Billabong also includes a large bathroom with two person bath. Continental breakfast provisions provided. No cooking facilities. Please note this property does not accept children under 12 years old. The Billabong offers a king bed studio room which can be split to create two single beds if requested at time of request. The Billabong also includes a large bathroom with two person bath. Continental breakfast provisions provided. No cooking facilities. Please note this property does not accept children. The Dunes offers a queen bedroom with an ensuite and shower. The property includes a kitchenette, however, with limited cooking facilities. Please note, this property does not accept infants or children under 12 years old. The Gums offers a queen bedroom with an ensuite, shower and a single sofa bed for a third guest, available at an additional cost. Fully equipped kitchen with open lounge dining area, outdoor deck with barbecue. Continental breakfast provisions provided. Please note, this property does not accept children under 12 years old. No refunds for single or two night bookings but alternate dates may be possible by calling direct if original dates can be filled. A 50% refund for longer bookings if cancelled 21 days or more prior to first day of stay. Cancellations within 21 days will forfeit all monies. We highly recommend taking out travel insurance to cover any unforeseen events.